In 10 years I have not seen frogs in the stream next to our house. This spring, we have three… (One hopped away as I was taking the photo) Perhaps this is a good omen? 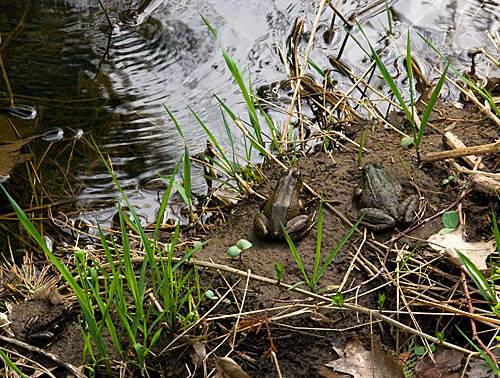 Amphibians have been on the decline in Ontario and to have the Spring Peepers chirping off in the marsh and frogs in the stream is reason for celebration. Inspired by my frogs, I went for a walk on my favourite forest trail and I was greeted by tiny fragile violets, red and white trilliums and the odd trout lily bursting from the forest floor. I sat amongst the trees and allowed the blackflies to hover (they’re not biting – yet!) and next to me on a bit of granite was the most impossibly electric green moss. I do not often get political on this blog, but there is an issue that if it is not handled immediately has the potential to ruin some of the most valuable farmland in Canada along with the headwaters of three major watersheds in Ontario. 1.5 hours NW out of Toronto is a proposed mega-quarry. If you want to build a bridge over a stream in Ontario, you require an environmental assessment. This 8000 acre quarry according to the Ministry of the Environment does not! To understand the issue and how it will impact farmers, food, and the water quality of the entire GTA please visit the “Stop the Quarry” on Facebook or the North Dufferin Agricultural and Community Task Force website. I guess it is no surprise that we have sold the house? While the frogs are moving in, we are making plans to move out. The problem is, we are not certain as to where. I am hoping that our lives will return to Earth soon… Back in the studio, now that I can actually pull everything out without preparing for showings, inspections and what-have-you, the painting for St. Stephen’s (version 2) is underway. The frogs are hope an renewal for me. While I will grieve moving from this house – my first house – I am looking toward a very promising future -and at the very least, a few very interesting months… I am hoping that there will be frogs at the new house too. A bit ironic that the frogs show up just as you’re leaving? Still, such natural come-backs are always a wonderful thing. Those look like contented frogs, btw. Hoping your move is good for you. I am not sure irony is a good thing here…. 🙂 Perhaps they were always there and just now they are letting me see them. That could be a good omen – less irony, I hope? Exciting times for you but always a little scary. Wherever you go thre will be something to observe. The last house I was at had frogs, toads and newts and I miss them but there are plenty of things to observe here too…. Sorry to hear about the quarry. That’s just wrong.